A Mt. Sherman winter summit had been a goal of mine nearly since I arrived in Colorado. It is an easy climb but had eluded me because of deep snow on the road to the trailhead. 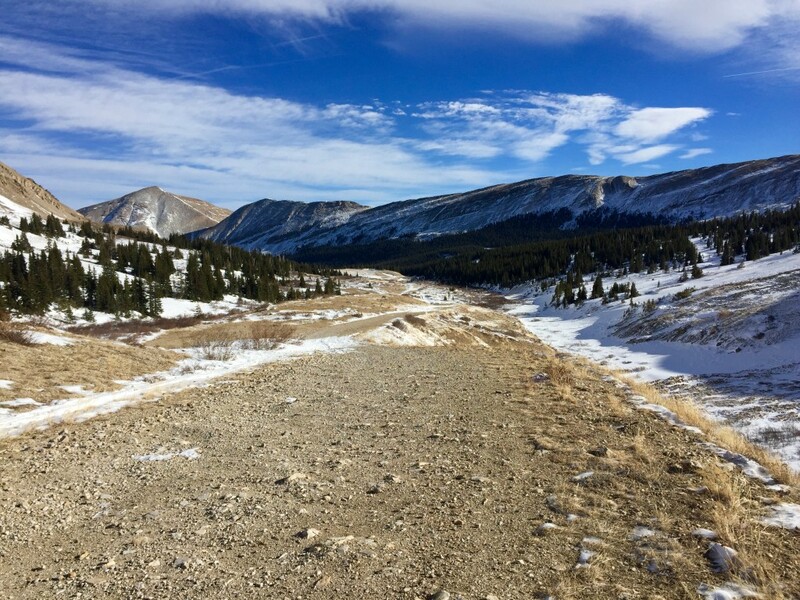 Just outside of Fairplay, Colorado, the road is dirt for nearly 15 miles and unplowed for the last three miles. I barreled my car into a snow drift a week ago and was back to see if the road was any clearer. But while solid tracks went further than last time, my car was high centered on a massive snowdrift miles from the trailhead again. I had stopped at Pizza Hut on the way in to use their Wi-Fi to gain some beta on the climb and drove straight here a little after 8 to get an early night’s sleep. But with my car stuck in the middle of the road, I figured I’d need to get out before I climbed in the morning. Despite the low traffic of a mid-week trailhead road, I still worried about some massive truck with snow tires plowing down the road bummed about me blocking the way. With my mountaineering shovel I went to work digging the deep snow out from the center of my car. I worked boards under the wheels and some pine boughs as much under the tires as I could. But at midnight, after nearly four hours of working on it, I decided to get some rest and try again in the morning. I figured the heat from a warm car might lower the snow under the belly of my car and allow an easy out in the morning. And when I started the car up the next morning my thinking was right. I backed my car up easily off the berm and was headed back down toward plowed road. But less than 100 yards later I slid into another snow drift and my rear wheels slipped downhill and off the road into a drainage ditch. I tried moving back forward but with the slight uphill grade only made it a few feet. I backed up a little to gain momentum and then forward again to get out. But after a couple of tries, my car stopped still and the tires lost traction. I was totally stuck again. I figured this would happen with the downhill slope back out. But what I wasn’t prepared for was seven hours of work to get unstuck this time. I thought so long as I wasn’t high centered it would be an easy fix with pine boughs and boards under the wheels. But after a couple hours, I took a break in my car and called my parents to ask their thoughts on the bind I was in. 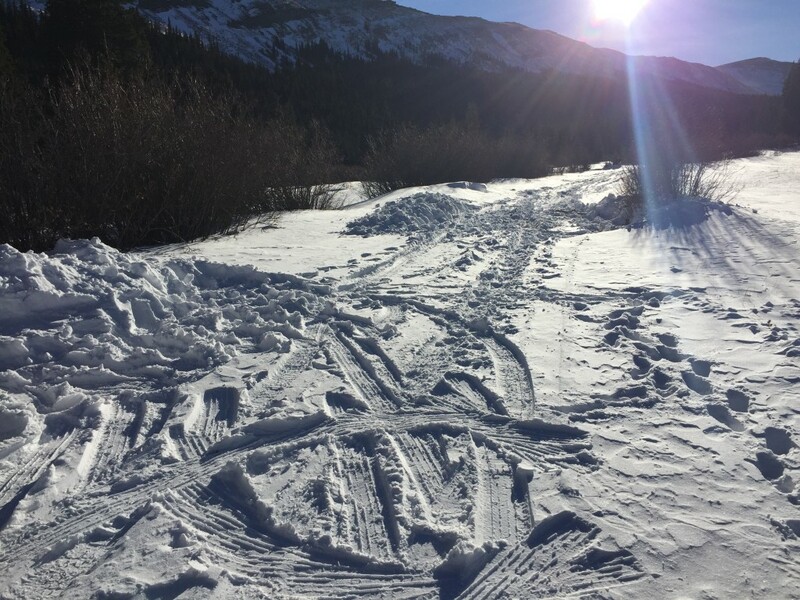 They recommended I give AAA a call but with being 15 miles off road, the surcharge would be $250 and the tow company needed to wait till tomorrow morning to get a snow cat out here. So I set back out to work, this time with the idea of jacking each of my wheels up to get the pine boughs and boards solidly underneath. 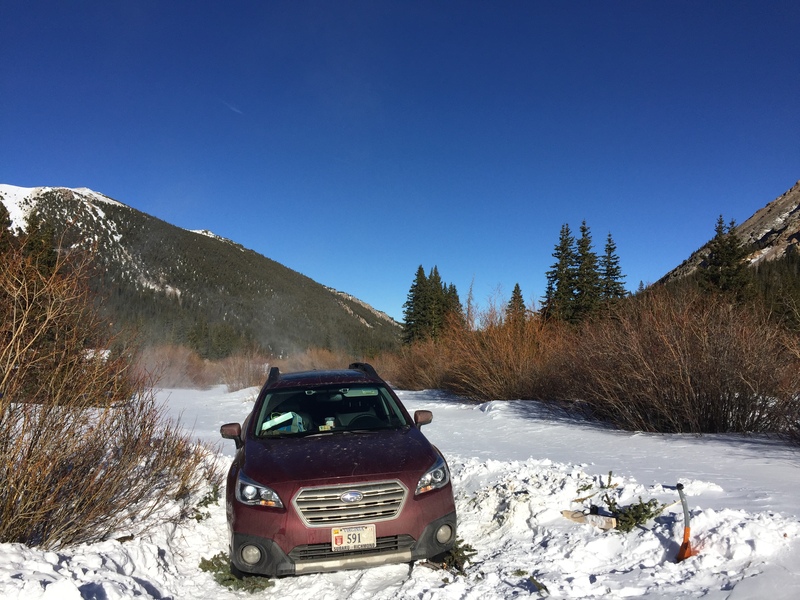 But using a standard car jack in snow isn’t easy, and with high snow drifts entailed using the boards to make an even surface and pack down the snow. After lifting three of the wheels though, my car lurched forward a few feet and then to a stop. I backed up a foot, put the pine boughs in front of the wheels, and moved again another few feet. And again until finally I was on a windswept section of road. I set to work digging out the entire four foot high snow drift which I still had to pass through and after another half an hour, had mostly clear road behind me. I backed up slowly and cleared the spot I had been stuck in. But within less than a hundred yards I was again stuck. I walked back up the road, grabbed the pine branches, and set back to work in the same fashion as before. Within an hour I was unstuck again and committed to turning around to be able to drive straight out this time. I cleared an entire section of road and snow drift at a wider section and did a 15 point turn to get turned around. Smooth sailing back down to plowed roads but the sun was on the horizon. I called my parents elated with being out but they dreaded that I was committed to staying the night on the exact road to climb Sherman in the morning. After all this, I was grabbing that summit, no matter what. The next morning I set out around 10am with snowshoes on to break trail in the deep snow. The sky was clear with the dark blue of high altitude and I began my trek just under 11k feet. 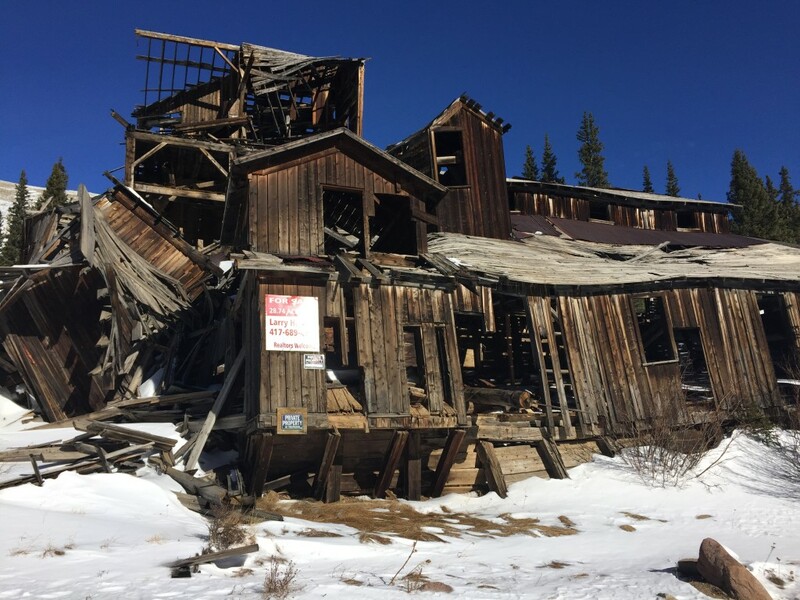 Within a couple miles I passed a dilapidated old mine with a “For Sale” sign on it. Figured it could be a fixer upper. Halfway up the road I took my snowshoes off on the windswept rocks to save my snowshoes from getting any more ripped up on the shallow snow. I had broken one off on the descent from Evans down the steep rock and snow gully and didn’t want to do any more damage. My jacket had been stored in the bungees on the back of my pack and somewhere in the next couple miles of road walking slipped out from the snowshoes whipping back and forth on the outside of my pack. I realized it when I stopped to put my snowshoes back on at a mine further up the mountain and considered putting my jacket on too. But when I dropped my pack to the ground, the $450 jacket was nowhere to be seen. I quickly strapped back on my pack and started looking around the immediate area, then started back on the descent to go find it. But just a quarter of a mile down, with no sight of my jacket, I stopped. I thought, I could keep going, find my jacket just sitting there in the middle of the road, and have to regain all this elevation. It was after all a fairly windless day down in the valley. And I knew I didn’t really need the jacket. It wasn’t that cold and I had a fleece and a down jacket still in my pack. So I started working back up the mountain, hoping that my jacket would be there for me when I descended. 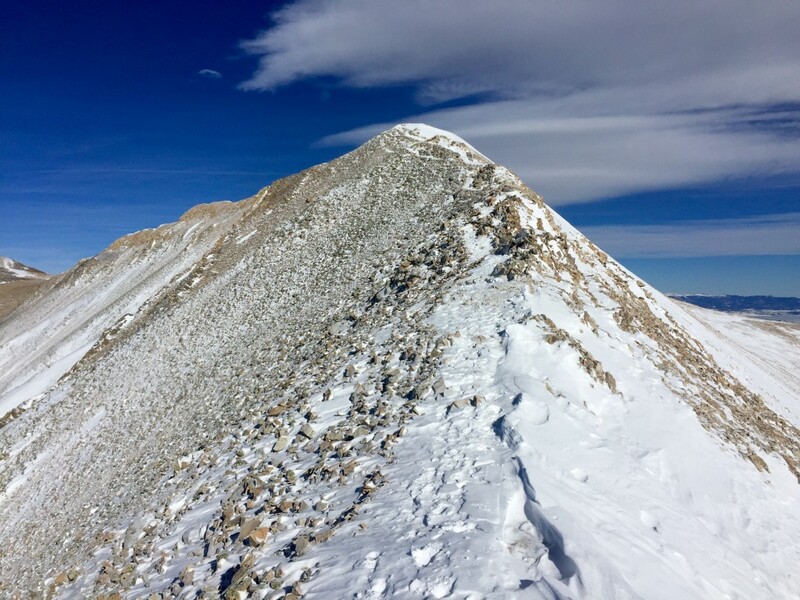 The trail kicked up to the summit ridge and I took the most direct route, a heavily corniced section of steep snow. I had to break off the cornice at the top to crest over the top, digging my front points in on my snowshoes to keep from sliding all the way back down. But up on the ridge I took my snowshoes off again to traverse the windswept rocks. I raced to the summit, with each passing step getting more and more worried about my jacket, and totally forgetting to stop and appreciate the beautiful views. The wind picked up and I really starting wishing I had my jacket. 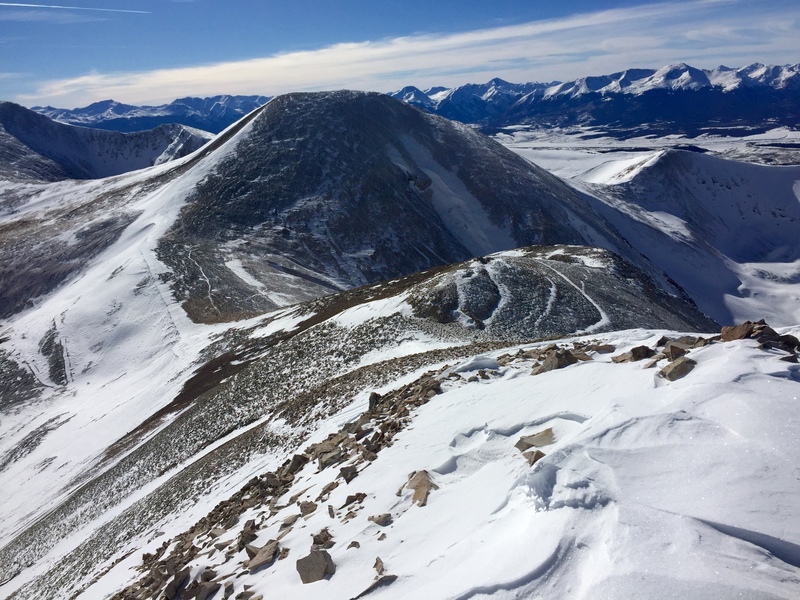 But up on the summit, even if just for a few moments, all my concerns disappeared and I loved looking out at the powerful Colorado landscape. With windchills just above zero I was amazed to be reasonably comfortable with just a t-shirt on my torso. But even with my sped up metabolism from adapting to this crazy climate, I had to get started back down. From a high vantage on the ridge, I saw three people down on the saddle between Sheridan and Sherman. I thought for sure they must have come up from the Fairplay side where I had come from and found my jacket. I was convinced and excited and slid down the snowfield to catch them. 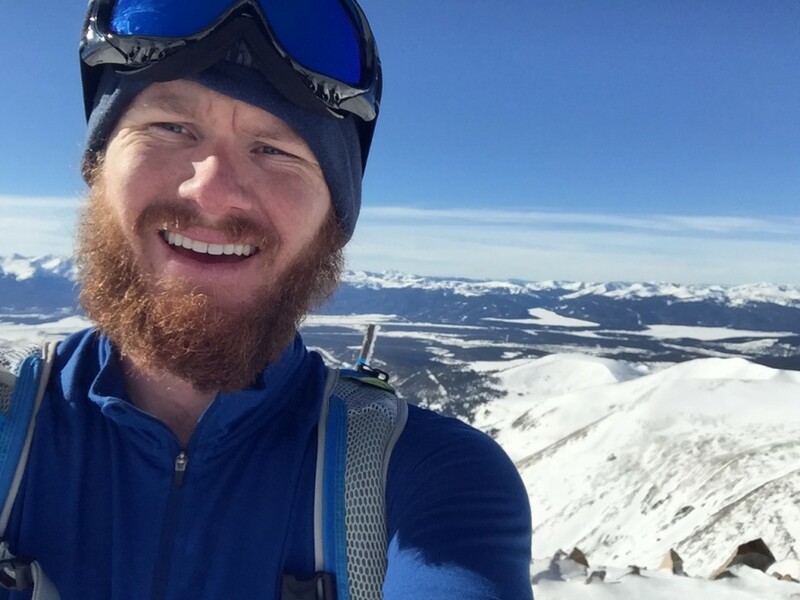 But two of the guys started working toward the other side of the mountain, toward Leadville, and I lost hope. One guy continued up toward me, his giddy dog jumping around on the rocks, running circles around him. His dog came running up to me and I wanted so badly to pet him and play with him but his excitement was too much and he ran off again. When I got down to the other climber I asked him and he confirmed they had come up the other direction. Disappointed as I was, at least there was still hope my jacket was just down the road. I passed the Hilltop mine, I dropped down onto the road, passed the mine where I first noticed my jacket was gone, and started hunting fiercely for the black jacket amidst white snow and black rocks. I beat myself up, telling myself I should’ve turned around earlier, that no summit is worth the price of losing my most expensive piece of gear next to my four-season tent. I told myself I should’ve bought the light blue jacket over the black one; what kind of a moron buys a black jacket? A mile later a black spot on the brown dirt road came into view a quarter mile down and I was convinced it must be my jacket. Wouldn’t I have seen something so dark in the middle of the tan brown road earlier? I kept looking left and right though, not wanting to hike back up if it turned out it wasn’t my jacket. It wasn’t until I was nearly overtop of the dark spot that I caught a glimpse of the Arc’Teryx logo and began my celebration. Like it had been waiting for me the entire time, it just sat there in the middle of the road, bundled up nearly exactly as I had placed it. I hugged it, a piece of gear which has undoubtedly saved me from hypothermia on numerous occasions and I was so happy to be reunited with it. It’s a sort of strange bond I form with my gear. I often depend on it with my life and it always follows through. Like a cyclist feels a bond with their machine and a race car driver feels with their vehicle, a mountaineer feels with their gear. It’s an extension of my body, and in this case, it’s the extra layer of waterproof, windproof skin that I put on to keep my heat from being sucked away by the elements. I wear it nearly every day out here and without it feel naked in the high mountains. So call me crazy, but I was absolutely thrilled to be back with my jacket. On the store racks it may be just a nice cut of Gore-Tex fabric, but for me in those 14ers, it’s an essential piece of what keeps me alive. I kept my snowshoes off and tightly followed my tracks on the way out and was thrilled to be back at my car around 3:30 in the afternoon. I joked with my mom that the Mt. Sherman winter climb had nearly taken $700 from me between the tow and the jacket and that the mountain was conspiring against me. Of course both dilemmas were completely my fault. 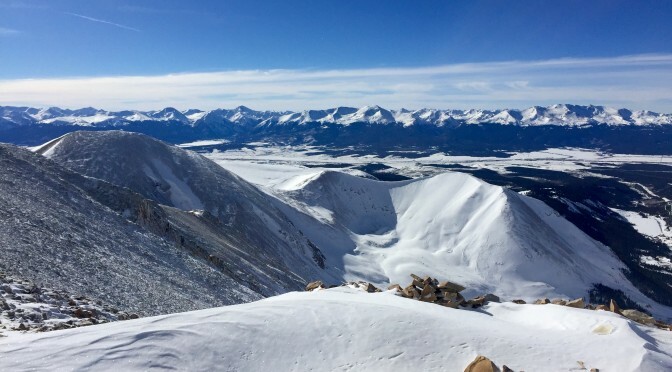 My parents desperately hoped that I would head straight for a reasonable sized town to get some new tires but to their frustration headed straight for Buena Vista to pick out another peak to climb the next day. Now that’s what I call an adventure. I haven’t been to Sherman, but been to another place in Asia where I experienced something similar. The getting stuck the shoes and everything else is just not so good, but adventures are meant to be that way 😉 Thanks for sharing your experience Grayson. It’s not an adventure until something goes wrong! Thanks for stopping by Cindy.